You don't need a magic carpet to see the world. All you need is Maps That Teach. 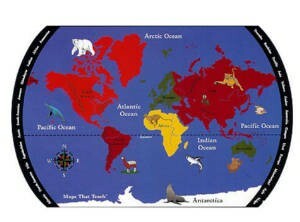 With its bright, primary colors, animals, all five continents, seven oceans, major rivers and mountains. Maps That Teach is amade with the same quality as all the other Flagship rugs. Includes a teaching manual with learning games.